The road to the Medal of Honor is never quick or easy, but for former Spc. Jim McCloughan, it took two days of unrelenting fire, 10 lives saved, 48 years and an intervention by Congress to get here. President Trump draped the military’s highest award around the Vietnam combat medic’s neck Monday in a ceremony at the White House. McCloughan, 71, was joined by 10 battle buddies from C Company, 3rd Battalion, 21st Infantry, 196th Light Infantry Brigade, Americal Division, whom Trump asked to stand and be recognized with a round of applause. “Today, to 320 million grateful American hearts, [he] carries one title, and that title is ‘hero,’ “ Trump said. The ceremony was attended by Army Chief of Staff Gen. Mark Milley, Sergeant Major of the Army Dan Dailey and Defense Secretary James Mattis, as well as Army Surgeon General Lt. Gen. Nadja West and the White House chief of staff, retired Marine Gen. John Kelly. Spc. Jim McCloughan, 71, said a lifetime of athletics gave him focus and mental discipline — traits that he took to the battlefield in Vietnam. He was awarded the Medal of Honor on July 31, 2017 by President Donald J. Trump at the White House. McCloughan, 71, was joined by 10 battle buddies from C Company, 3rd Battalion, 21st Infantry, 196th Light Infantry Brigade, Americal Division, whom Trump asked to stand and be recognized with a round of applause. The then-23-year-old medic had been plucked from a position as a coach at his alma mater, Olivet College near South Haven, Michigan, in 1968, and sent to Vietnam, where a fateful ambush in May 1969 led to a hellacious two-day battle — 89 American soldiers versus an estimated 2,000 North Vietnamese troops. He told some close family about the situation, but when on to teach and coach for 38 years. Soon after his retirement, in 2009, his uncle announce that they had an appointment with their congressman, Rep. Fred Upton, R-Michigan. Former Spc. Jim McCloughan had just graduated from college when he got a letter from the U.S. government in May 1968. He was to report for a physical. Democratic Michigan Sens. Debbie Stabenow and Gary Peters joined the effort after McCloughan applied for his upgrade with the Army. They helped bring the award across the finish line late last year with a provision added to the National Defense Authorization Act, making an exception for McCloughan to receive the award more than five years after the action in question, which is the existing law. Army Spc. 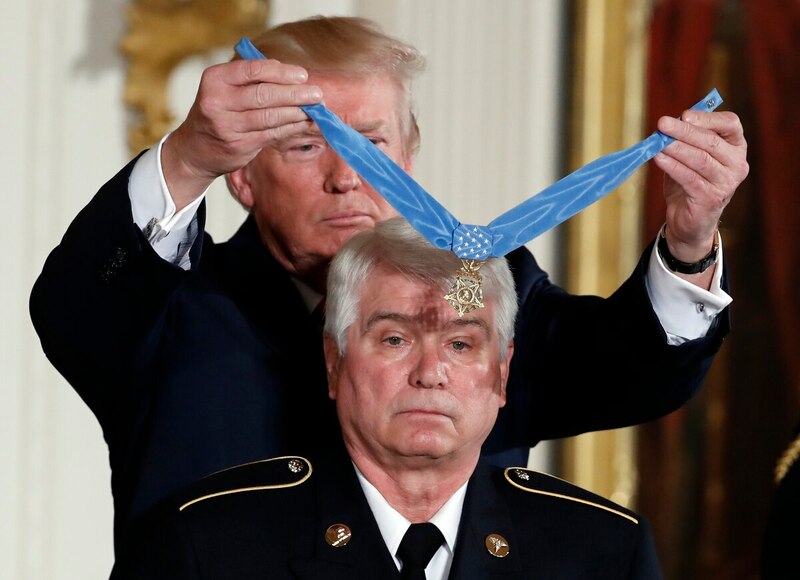 Jim McCloughan, 71, receives the Medal of Honor during a July 31 White House ceremony. McCloughan was a combat medic who risked his life dozens of times and managed to save 10 soldiers during a two-day battle versus 2,000 North Vietnamese troops.